Midfielder Pham Thanh Luong made national football history on January 4, winning his fourth Golden Ball as the best male player for 2016. 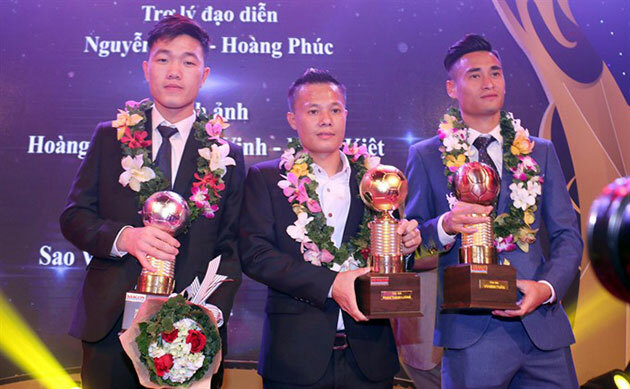 Luong, a former member of the national team, who also plays for Hanoi FC, beat four nominees in the category to take the title at the award ceremony held in HCM City. The silver went to young midfielder Luong Xuan Truong of Incheon United, while striker Vu Minh Tuan of Quang Ninh Coal bagged the bronze. Truong scored a double, with fans voting him the most favourite player of 2016. “I want to thank the leaders of the Vietnam Football Federation, Hanoi FC, my teammates and all fans who strongly supported me in practicing and competing during the whole year. I promise to contribute my best to national football,” Luong said in his acceptance speech. Luong had a highly successful year in 2016. He was one of key players for Hanoi FC as they won the V.League title. His club also came in second at the National Cup. The 28-year-old and his team played in the Super National Cup against Quang Ninh Coal and lost the game narrowly in a penalty shoot-out. He was a regular member of the national team before he announced his retirement last month after Vietnam’s failure at the ASEAN Football Federation (AFF) Cup. Earlier, Luong won the Golden Ball in 2009, 2011 and 2014. Luong was groomed at a training centre in Hanoi. He was called to the national team in 2008, the year when Vietnam won their only AFF Cup thus far. He played 72 matches and scored six goals for the national team. His achievement ranks behind striker Le Cong Vinh (83 matches and 51 goals). The Golden Ball for the female players went to Huynh Nhu of the HCM City team. Her club mates Chuong Thi Kieu and Dang Thi Kieu Trinh grabbed the silver and bronze, respectively. For the first time, organisers honoured futsal players this year. With their outstanding performance in both local championships and at the national level, the Thai Son Nam Club dominated the game. Tran Van Vu won the top title, followed respectively by Nguyen Minh Tri and Nguyen Bao Quan. In other categories, Gaston Merlo of SHB. Da Nang was voted the best foreign player of the year. The striker could not take part in the ceremony yesterday because he is injured. This will probably be the last year that the Argentinean player can vie for the title. He has recently granted Vietnamese citizenship. His Vietnamese name is Do Merlo. The best young male player title went to Vu Van Thanh of Hoang Anh Gia Lai while Le Hoai Luong won best young female player award./.